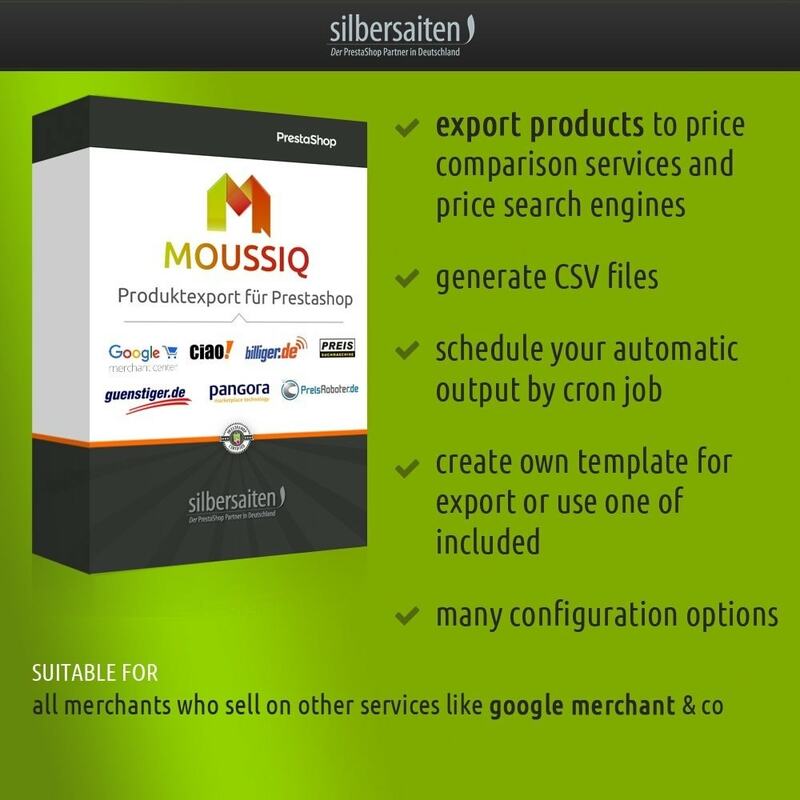 Moussiq PRO is an export module, that allows you to export your PrestaShop product data to any price and product comparison engines, selling portals, or to use it for your own analytics and spreadsheets. 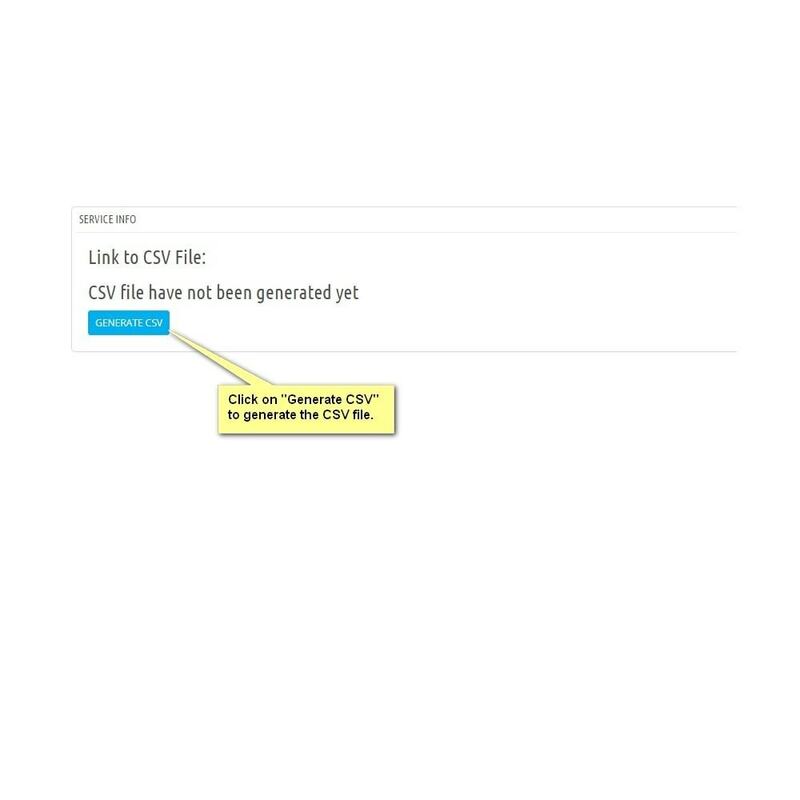 You generate your export file and can customize it by combining the fields via Drag & Drop. The number of templates that you create for exports is unlimited. As part of the export designer you get access to all product fields created by PrestaShop. These include product name, deep link, categories, EAN, image URL etc.. When importing prices, you can choose whether the price has VAT (Value Added Tax) included, delivery costs or discounts. 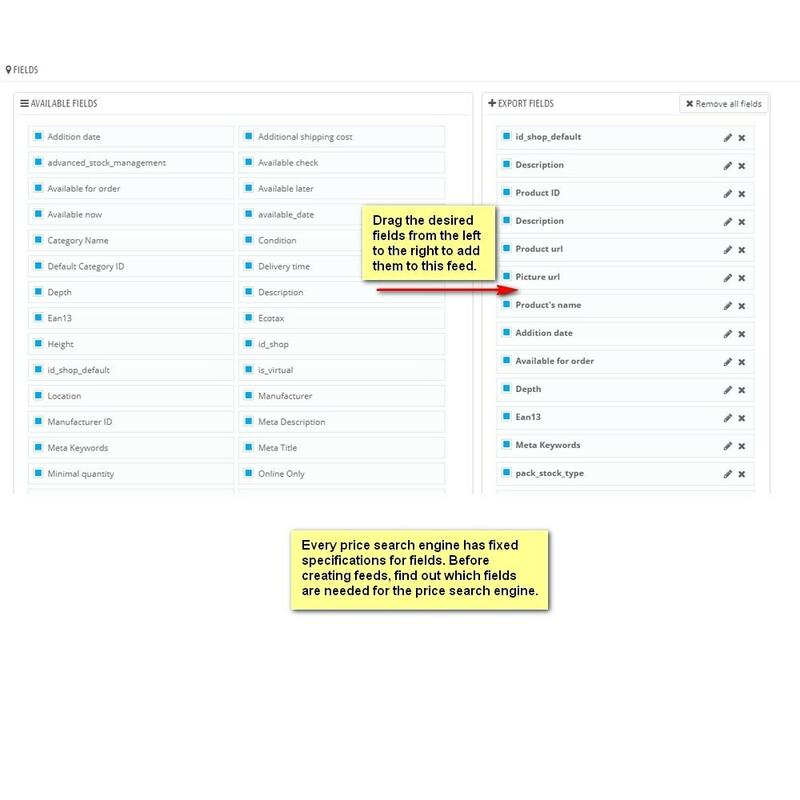 In all fields, you can add custom content before or after the actual content of the field. 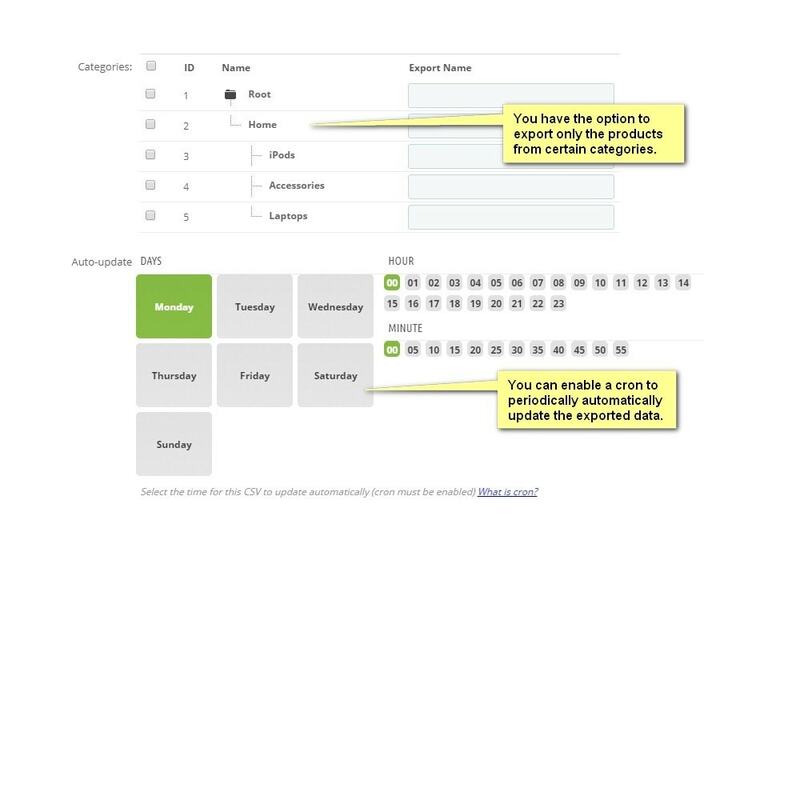 You can also fill out additional fields fully equipped with your own content. 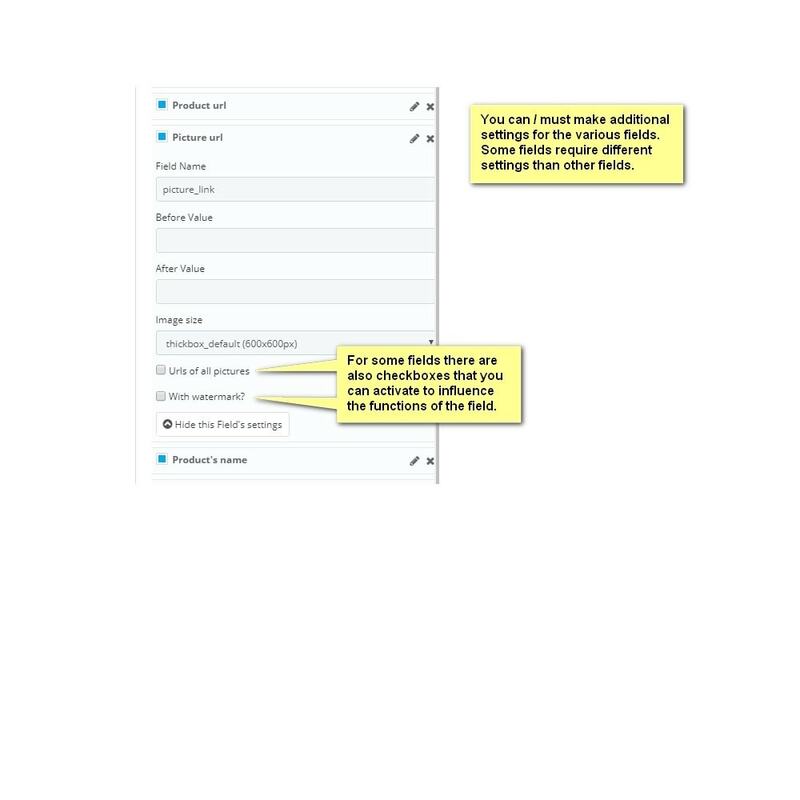 Many other settings help you to organize the export files flexible enough to meet all the requirements of different providers. Moussiq includes automatic updates scheduling of the export file. You set the weekly rhythm and time, the module will do the rest. To make the application as efficiently as possible, we offer the ready-made templates, that meed the specified requirements of the comarison service provider. Uploading the template into the module is quick and easy. You can modifyy the pre-defined templates to your needs. The templates are created according to the requirements of German price comparisons, however, can be very easily be adapted to the needs of your country or other services. 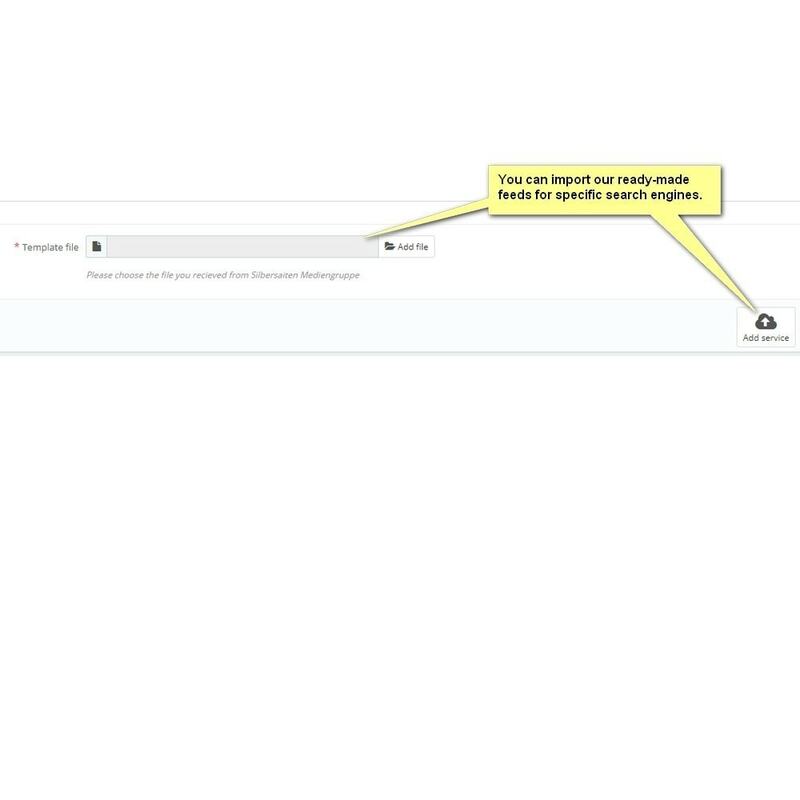 You can easily export and import the created templates. This is very handy if you have multiple stores or would like to create a ready-made template. Some price search engine operators use the assignment price of the products ahead in the search engine's own award categories. The module gives you the ability to manually add category paths of your exports and thus precisely mapping the category structure of the price search engine. 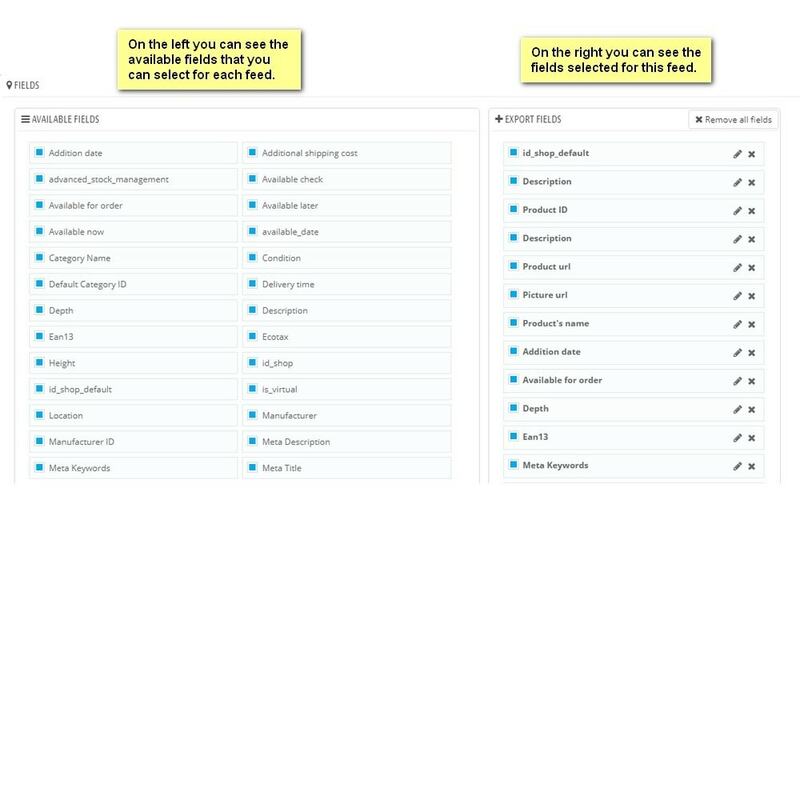 You can select to export all or only certain categories. With every offer all possible product combinations can be provided with separate product IDs and exported as individual products. 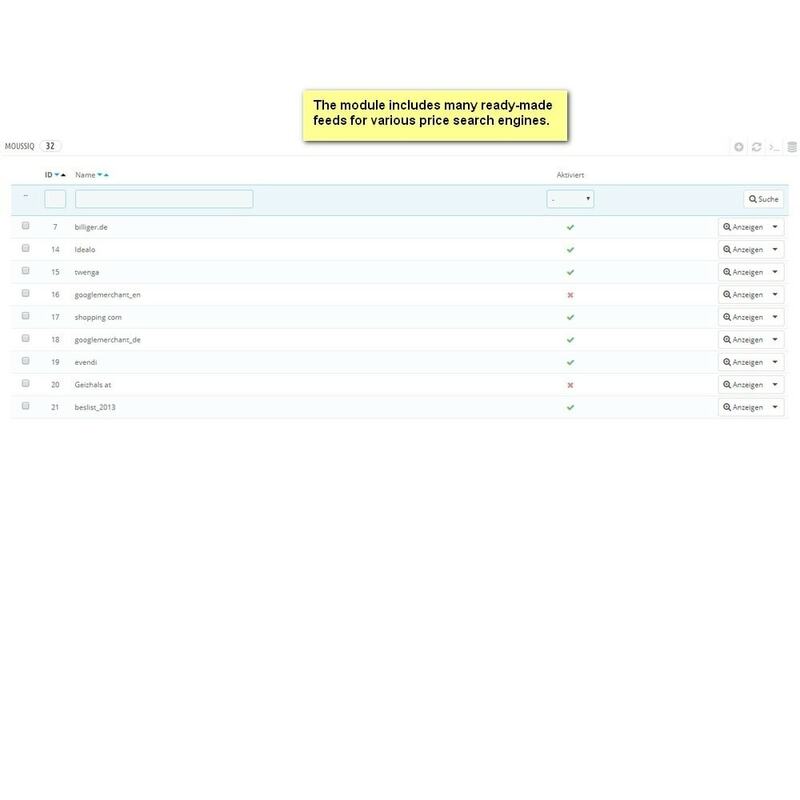 You decide for any price search engine yourself whether the combinations of products are to be exported. Many price comparison and market places offer convenient filter functions for your customers. 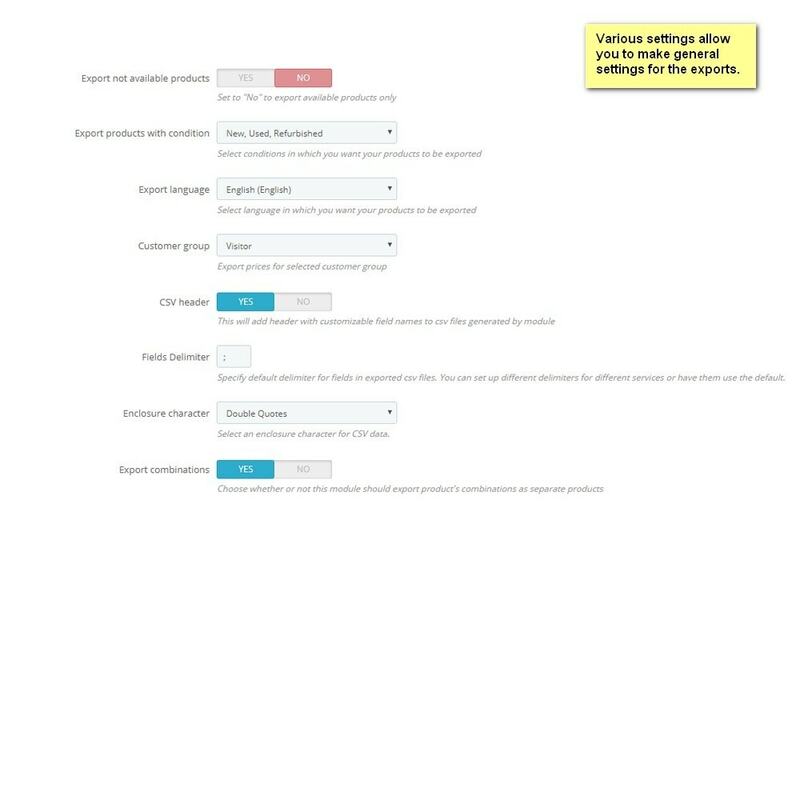 With this function you can make your export files efficient in order to be found in search results for all possible criteria. With this function, the last missing link has been established to enable the full product for PrestaShop exports. Calculation of shipping costs based on the input of the mailing zone and shipping carrier. The variations in the cost calculation (eg consideration of the delivery fee at cash on delivery shipping), you can add manually. The product exports can be incorporated for own evaluations in a spreadsheet. Connecting to any price search engine is straightforward and user friendly. When creating export files, a link is created. This is to inform the operator of the price. The operator inserts the link into his system. After your products are presented in the search engine and price is accessible to customers.